All righty, Dinner or Carriage dresses were worn to evening of later afternoon events that were formal, but not formal enough to warrant full-dress. Carriage dresses are often identifiable, because they are are more fussy and formal than promenade dresses. The basic order of formality is a walking suit is less formal then a promenade toilette which is less formal than a carriage dress. A dinner dress is less formal than a evening dress, but may also be worn to evening events like come concerts or lectures. Opera was its own insane category. Who ever said Victorian dressing was simple? A pale blue bolero jacket with pale blue sleeve puffs worn over a lavender corset with brass button accents. The neckline of the corset is filled with a pale blue high-necked blouse. 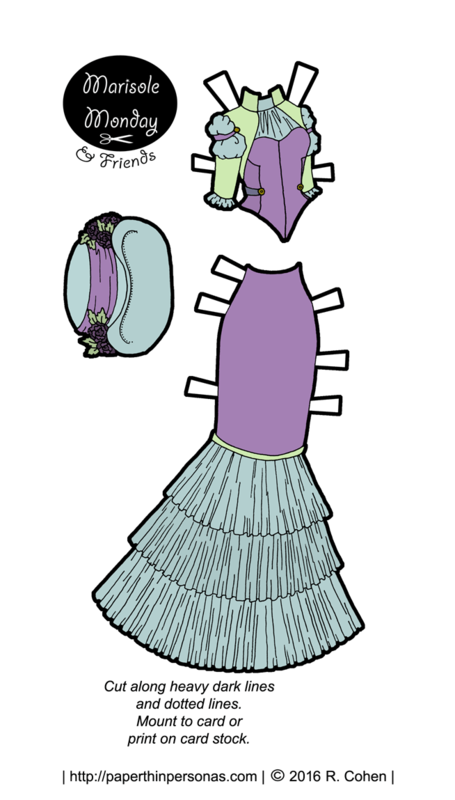 The matching skirt is lavender and trimmed in pale green with three rows of blue ruffles. The hat is a bowler style trimmed with dark purple fabric roses and a wide blue ribbon band. Without the hat, this ensemble would be a lovely dinner attire and with the hat would be appropriate for afternoon visiting or carriage rides. So tell me in a comment what era of history you’d like to visit sometime. I’ve never been able to settle on one, but I think it might be fun to visit the Library of Alexandria or the Aldine Press in Venice. Thoughts from all of you? What time period would you like to visit? If you missed Monday, pop over to that post for Monica and if you love the blog, consider becoming a patron. So, here we are in week two of the new system for PTP. It’s very exciting. I am feeling excited. Also a little nervous, I must confess. Monica is our model today. She is, of course, from the Marisole Monday & Friend’s series. This whole week will be a neo-Victorian/Steampunk inspired week with hats, skirts and jackets. As I know I’ve said before, I have a THING for the whole idea of different outfits for different activities. When I’m in Victorian fantasy land, I like to decide which outfit goes with which Victorian activity. A lady of quality in the Victorian era had a variety of gowns at different levels of formality. At one end of the scale was the house dress or morning dress and at the other end of the scale was a ballgown or full-dress. A promenade or afternoon visiting costume in purple wool with a matching jacket. Underneath the jacket, the model wears a lavender shirtwaist. The jacket is trimmed in pale teal and aqua velvet and satin. A wide band of lavender satin decorates the skirt and then several rows of aqua ruffles. The chapeau is dyed to match the suit and trimmed in rosettes of aqua silk, feathers and brass buttons. The entire ensemble is quite smart for street or afternoon wear. Sometimes I am conflicted as to whether I like the term Neo-Victorian or the term Steampunk better. The truth is that I think this set is more Neo-Victorian in its styling. One of the tropes of Steampunk is high technology made through steam-power and there’s none of those aesthetics in this paper doll. However, no matter how I feel about it, I confess that the SEO for steampunk is far better than the SEO for neo-Victorian. Thoughts from the audience on that one? Oh, and a few “housekeeping” things. 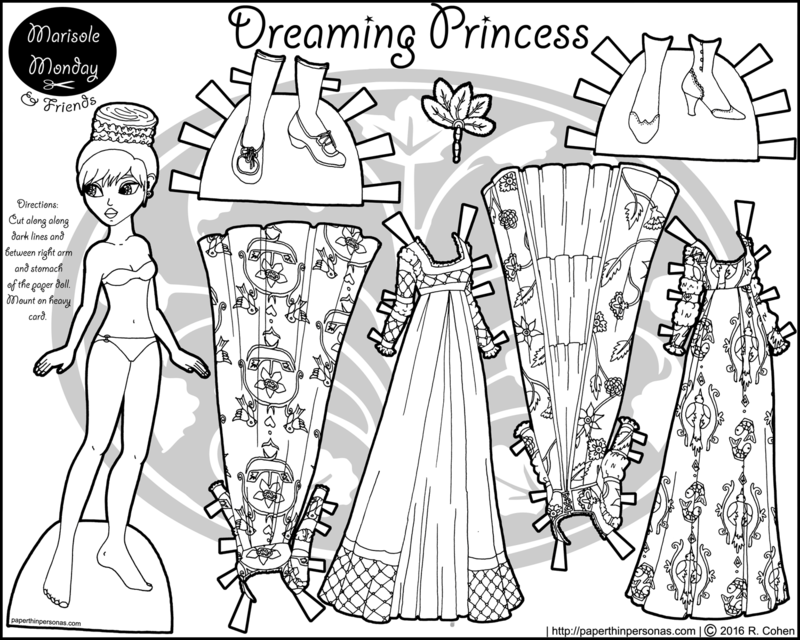 The link to the coloring page version of today’s paper doll is at the top with the links to the PDF. As always, I strongly urge you to print from the PDF copy and to print it however you have been printing them from the beginning. That will assure that the new stuff and the old stuff still fits. Last but not least, please consider taking a second to support the blog by becoming a patron. I’ll be among the first to confess that I am pretty matchy-matchy in my own dressing. I do want my shoes to match my purse and my belt. I realize that’s horribly old fashioned, but I just can’t help it. Unless I’m carrying like teal bag and then I can have on any shoes I want, but if I have a brown bag and black shoes, than I spend the whole day feeling discombobulated. (Dumb, perhaps, but true.) Anyway, I tend towards the same tendencies when designing paper doll clothes. I think part of it is that the better the colors in the paper doll’s clothes match, than the more outfit options open up. It’s an issue of “playability” in my head. 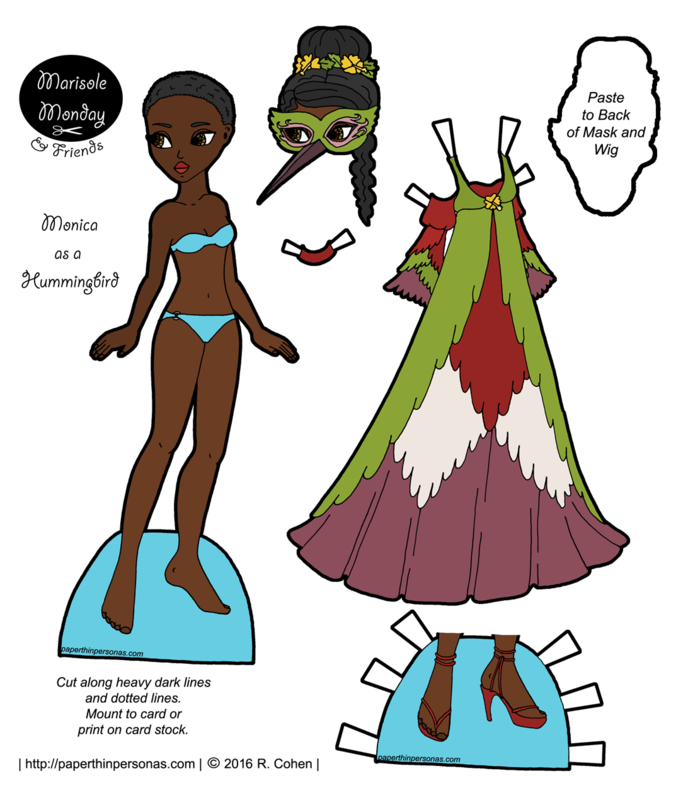 I want every Marisole Monday & Friends set to have a doll and paper doll clothes that could stand alone and be fun by itself. I mean, we all have gotten paper doll sets and cut them all out and then be sad when we realize that really there’s only a few clothing options. However, I also want every set to be able to share with the other sets. That’s the main reason why, for example, all the Marisole Monday & Friends paper dolls share the same pose. If they can’t share than what’s the point? 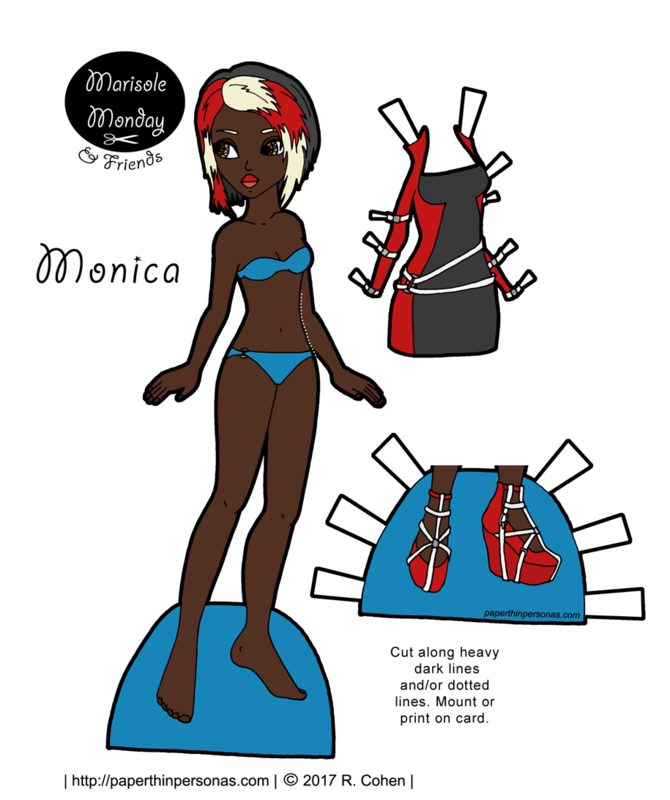 When selecting colors for today’s Monica paper doll, I close to go with a lighter brown for her skin, because I liked how it looks with the lime green. 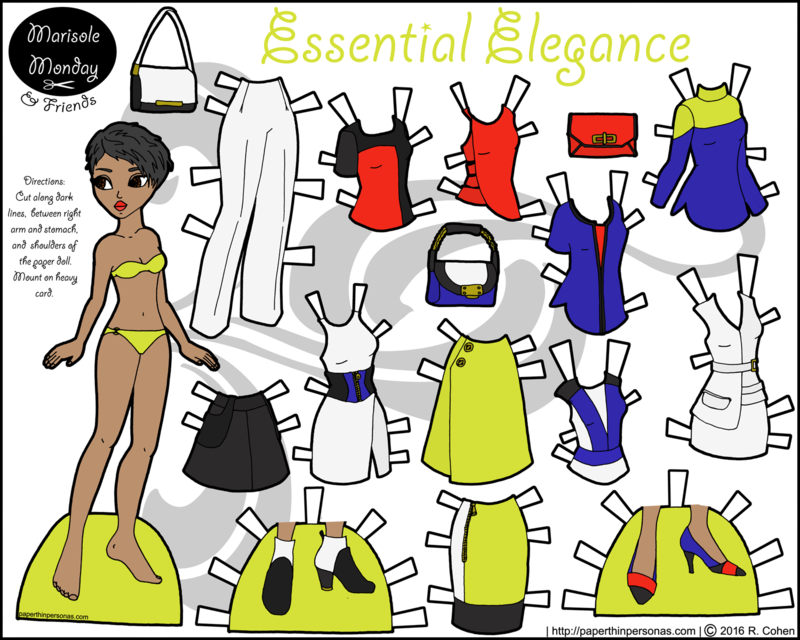 The red top and the white dress were the two pieces that inspired the whole set of paper doll clothes, so it wasn’t hard to decide to keep them their base colors. The blue was choosen to tone down the bright red and it’s strong contrast with the bright green. Personally, my favorite part of the set is how the white and black booties came out, but that’s just me. As always, I’d love to hear what anyone things in the comments and if you like the blog, support it on Patreon.